Leyla Mustafayeva and Afgan Mukhtarli, 2016. Source: Author's personal archive. Four months have now passed since my husband, the Azerbaijani investigative journalist Afgan Mukhtarli, was abducted from Tbilisi and illegally delivered into the hands of the Azerbaijani government. Initially, this case was investigated by Georgia’s Ministry of Internal Affairs. Now it is under the purview of the Chief Prosecutor’s Office of Georgia. But despite the efforts of these two state agencies, the Georgian authorities have still not released any finding related to my husband’s abduction. I’m not sure they ever seriously intended to. Afgan fled to Georgia in January 2015 as a result of prosecution against him. In late 2014, he conducted a series of investigations into high-level corruption in the Azerbaijani army and other state agencies. When Afgan moved to Georgia, he started to investigate the investments of Azerbaijan’s ruling family, the Aliyevs, in Georgia — he was the first Azerbaijani journalist to do so. As Afgan revealed, the first family of Azerbaijan, namely Ilham Aliyev’s daughters Arzu and Leyla Aliyeva have a stake in Georgia’s banking sector. The family also own tourism and cargo companies operating in Georgia. My husband’s last article was about politically motivated abductions that he faced four months after publication. Recently, we met with some investigators in the Georgian Prosecutor’s Office regarding Afgan’s abduction case. The investigators said that they have sent CCTV videos for forensic examination in order to identify car license plate numbers involved in the abduction — several videos are of low quality and were recorded from a distance. I told the investigators that they don’t need to make their job too difficult. As Afgan has said, several Georgian-speaking men wearing Georgian police uniforms detained him on Niaghvari Street in central Tbilisi, beat him in a car on adjoining Ukleba Street in front of a small grocery shop, then turned the car back to Niaghvari Street, drove up to Daniel Chonqadze Street and took him through Shio Chitadze street where Georgia’s Ministry of Foreign Affairs and Italian Embassy are situated. These ministry and embassy buildings both have high resolution cameras. Investigators can easily see the license plate numbers of the cars from these videos. The investigation has to look into the car which transported Afgan to Chitadze Street. I believe that the Georgian Prosecutor’s Office is prolonging these procedures on purpose. They are working slowly, and this is to the advantage of the Azerbaijani Prosecutors’ Office, which continues to press trumped-up charges against Afgan. The current investigation in Azerbaijan claims that Afgan, currently in jail in Baku, crossed the Azerbaijani border illegally, smuggled €10,000 and attacked an Azerbaijani border service official. Here, Georgia is caught between two dilemmas. The Georgian Prosecutor’s Office cannot “prove” whether Afgan Mukhtarli crossed the border illegally or was abducted. When the investigation was under the control of the Georgian police, the Ministry of Internal Affairs stated that CCTV under the control of the police were switched off during the hours when abduction happened. The police had already intruded and doctored CCTV videos from private businesses, as the Rustavi 2 television channel has reported. Ten days after the allegation about the involvement of Georgian police officers in Afgan Mukhtarli’s abduction, the First Deputy Minister of Internal Affairs Besik Amiranashvili, who heads up the Georgian police, was dismissed from his post without any explanation. Then, later, the Head of Georgia’s Border Police and Chief of Georgian Counter Intelligence Agency were dismissed from their posts temporarily. Georgia’s Interior Minister stressed this step was taken to “exclude any questions in the case”. However, we still haven’t been able to find answers to our questions. Afghan Mukhtarli has been charged with smuggling in Baku after being kidnapped in Tbilisi. Image: MeydanTV.Dismissing these officials on its own does not make any sense. Afgan claims that he was forced to cross the border checkpoint without his passport. Actually, the border police officials who allowed it should have been immediately involved in the investigation, interrogated and necessary measures implemented. But this didn’t happen. Before 22 July, when the Georgian Chief Prosecutor’s Office took the case under investigation, we had already submitted photographs of the people who had followed Afgan prior to his abduction, but the police did not identify these people. They only surfaced after we published their photos on social media. Georgian police investigators informed us that the recording mechanism of the border checkpoint CCTV did not work during the hours when the abduction happened. Then, after four months, the videos from border check point somehow “surfaced”. The Prosecutor’s Office stated (but did not show us) that they have the relevant border checkpoint videos in their possession and that there is no evidence of violence and abduction. Whatever happened to us has already happened. But what will happen to the Georgian people? Regarding the videos of the unknown people who surveilled Afgan and his friend Dashqin Aghalarli, an Azerbaijani opposition activist in exile in Tbilisi, investigators from the Georgian Prosecutor’s Office said that about four months had passed and they can not obtain videos from private businesses as they have been deleted. The criminal case on Afgan’s abduction was launched after I made a complaint to the Georgian police in reference to Article 143.1 (Illegal limitation of freedom) of the Criminal Code of Georgia. We demand that Articles 143.2, 143.3, 143.4 also be added into the criminal case: the crime has been committed by taking the victim abroad with a prior agreement by a group using violence. This is about more than just the illegal deprivation of freedom. Neither Afgan, nor myself have yet been granted official victim status. Legally, this means that no one has suffered, and the abduction is not a serious crime. Georgian investigators claim there is not enough evidence to add the above articles to the criminal case. And unless these articles are added to the criminal case materials, none of us can be granted victim status. Neither I, nor my legal counsel have yet been able to read the criminal case materials relating to Afgan’s abduction in full. The surveillance of Azerbaijani dissidents living in Georgia continues even after Afgan’s abduction — indeed, I have now left Georgia due to concerns for my safety. On 29 June, in a Tbilisi café, an unknown man placed a laptop bag on the sofa as soon as I left my seat to visit the bathroom. The video that we watched in the Prosecutor’s Office showed that this man approached the table, put the bag on the sofa and left the place. It is obvious that he put the bag on the sofa by purpose. But the investigators started to defend this individual, saying that he is a solid person, a professor who speaks multiple languages. I found it interesting that this “polyglot professor” was walking around Tbilisi with an empty bag and, when I asked him “Whose bag is this?”, could not find any language to respond. He just explained me with gestures that the bag belonged him, grabbed the bag from my hands and moved away extremely quickly. 22 July, 2017: Leyla Mustafayeva and others protest the detentions of Azerbaijani journalists in Tbilisi. Source: Facebook. I checked the above bag when I took it in my hands and it was empty. I suspected that there could have been a listening device inside — why else would someone have placed the bag near a table where complete strangers were sitting? He placed the bag on the sofa so professionally that Dashqin Aghalarli, Afgan’s friend who was also sitting at the table, didn’t notice him — he was busy on his mobile phone. Surveillance intensified after Azerbaijani’s Ministry of Interior Affairs visited Georgia in early August. We delivered the photos and videos of the men whom we suspected of following us again when I was out walking with Dashqin Aghalarli and my four–year-old daughter. We wrote to the Georgian Prosecutor’s Office regarding this surveillance on 7 August, 2017. Two months on, they have not yet identified them. Who ordered Afgan’s abduction? Why were the CCTVs under the control of the Georgian Ministry of Interior Affairs switched off during the hours when abduction took place? Why has nobody been detained in this case yet? As to the people who followed Afghan, Dashqin, I and Rahim Shaliyev, one of the witnesses who saw Afgan last, on 19 September I published their photographs on Facebook in order to identify them. These men then surfaced as a result. 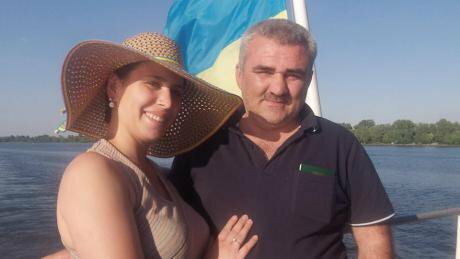 Before then, the Georgian Prosecutor’s Office had no information about them. We provided the Georgian investigators with their names. The Georgian Prosecutor’s Office does not have Afgan’s testimony. 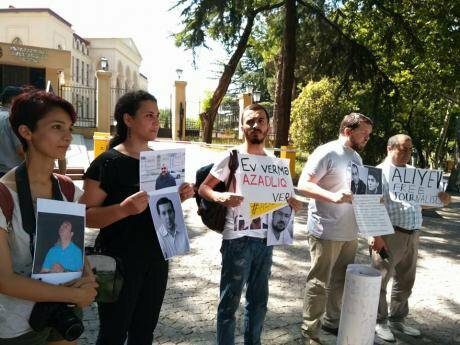 They claim they have applied to Azerbaijani Chief Prosecutor’s Office to interrogate him. However, no response has been received, investigators claim. This month, when the OSCE Media Representative Harlem Desir visited Georgia, the First Vice-Speaker of Georgia Tamar Chugoshvili stated that the results of the investigation into the abduction also depend on the Prosecutor’s Office of Azerbaijan. However, the Georgian side has not carried out a proper investigation. The abduction happened on Georgian territory. Afgan claims that the group of people who abducted him were reporting to someone occasionally in Georgian. These people beat and tortured him by putting a bag on his head. They wore Georgian police uniforms. Who ordered Afgan’s abduction? Why were the CCTVs under the control of the Georgian Ministry of Interior Affairs switched off during the hours when abduction took place? Why has nobody been detained in this case yet? As it happens, Azerbaijan’s Channel One and Elman Nasirov, an Azerbaijani MP, have answered some of these questions, saying that Afgan Mukhtarli was brought to Azerbaijan as a result of a joint operation of the special forces of Azerbaijan and Georgia. The Georgian State Security Service denies this. Afgan’s abduction has led to grave consequences for Georgia. There is now a Resolution of the European Parliament on this case, a statement of the US Department of State and statements by other European institutions. Indeed, the resolution of the European Parliament says that the Georgian authorities have to clarify beyond doubt all suspicion regarding the involvement of Georgian state agents in the forced disappearance of Afghan. Any illegal act committed in order to maintain a good relationship with Azerbaijan or violate the rights of a foreign citizen means that Georgia’s current government is ready to violate the rule of law in the interest of a tyrant. Whatever happened to us has already happened. But what will happen to the Georgian people? 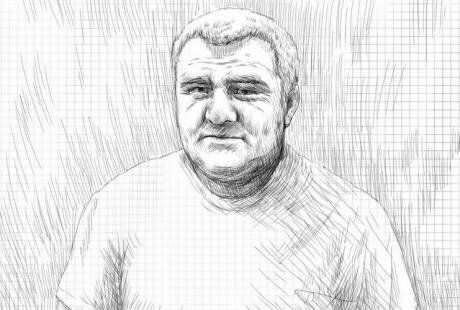 The more this investigation is slowed down, the more suspicion arises regarding the involvement of Georgian officials in the abduction of Afgan Mukhtarli, who today sits in pre-trial detention in Azerbaijan.